KC is one of LA’s most sought after, up and coming choreographers. After 10 years of experience in the commercial dance world he has started to make his mark in the choreography world. 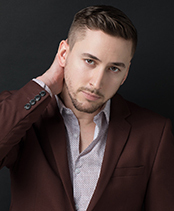 He has worked exclusively choreographing for Emmy award winner, Derek Hough, Emma Stone, Betty White, Lea Thompson, Dancing With The Stars’ Maks and Val Chmerkovskiy and Jane Lynch from fox’s hit show GLEE. With his mixture of classic and innovative style, KC’s choreography brings to life a fusion of many varieties. From old Hollywood to Ballroom, Tap, Technique and Hip Hop, He is proficient in all types of movement. Other credits include, Easy A, 2 Skechers commercials, Shania Twain’s world tour and Associate Choreographer to Director Kenny Ortega. He was trained and mentored by Emmy award winning choreographer Mandy Moore and Glee’s Zach Woodlee.